Auckland is by some considerable margin the most populated area of New Zealand, with around 1.6m of the country’s 5 million inhabitants calling it their home. It’s no surprise, therefore, that the city, and the suburbs and towns that surround it, are developing something of a reputation for craft beer. While Auckland’s craft beer scene may lack the accessibility and walkability of that of Wellington (be prepared to hop on a bus or one of the new electric scooters that have popped up across the city), there some real gems to be found if you’re willing to explore a little. N.B. The venues on this list were chosen based on my own personal experiences living in the city for the last two months. This list is by no means exhaustive, and entirely subjective. One of the very few places in Auckland, and indeed in New Zealand in general, to showcase proper cask conditioned ales, is Galbraith’s, an old school traditional English brewpub located in the Mount Eden area of the city. If you’re after a robust pint of traditional best bitter, or a delicately smooth and sweet ESB, Galbraith’s is definitely the place to find one. Brother’s Beer operates three venues in the Auckland region, but its City Works Depot is the most conveniently located, just a five minute walk from the Skytower. With 18 draft lines pouring a mixture of the brewery’s own brews and guest beers from all over New Zealand, over 200 bottles and cans to take away, delicious thin-crust pizzas and regular live music, it’s a great central spot for a beer or three. Top tip: Head round the corner to Best Ugly Bagel for freshly prepared and extremely tasty bagels with a multitude of toppings. Located down near Auckland’s viaduct in the up-and-coming Wynyard quarter, 16 Tun has one (semi) permanent tap, with the remaining 18 lines constantly rotating to showcase the best independent breweries in New Zealand. Combine this with regular tap takeovers, beer launches and food and beer matching events and 16 Tun is an essential stop for any craft beer lover. Top tip: Order a tasting crate of four, six, or eight beers to get the most bang for your buck (up to almost half the price of drinking by the pint). Just tucked away off the bustling and commercial hub of Queen Street is Vultures Lane, a pleasantly grungy pub with 28 taps and over 75 bottles. There’s a large TV screen showing live sports, and a secluded downstairs spot that’s perfect for escaping the hubbub of the city above. Sure, there’s Guinness and Corona here, but there’s also brilliant friendly service and more craft than you can shake a stick at. Top tip: Check out daily specials on food. Half price wings on a Thursday, or Fish and Chips for $10 on a Sunday is not to be sniffed at. Wellington’s Garage Project opened its Auckland taproom in March of this year, and it is proving (predictably) to be a huge success. The venue only has a tasting room license - so you won’t be able to get a full pint - but make sure to stay for a tasting tray and bring along your growler. 12 taps offer a rotating selection of the brewery’s beers, while there is also merchandise, cans, and bottles to take away. Top tip: Visit near the start of the month to try the brewery’s latest fresh IPA release, which is only sold in Garage Project venues across New Zealand. Just a stone’s throw from the Skytower and a short walk from Brothers Beer is possibly my favourite spot to drink in Auckland city centre. 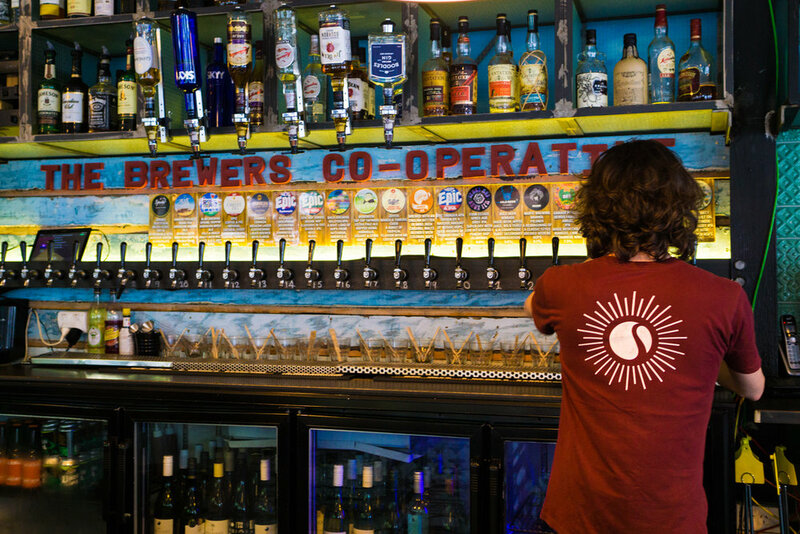 The Brewers Cooperative offers a superb choice of beers from across New Zealand and further afield, exotic seafood dishes (think fish tacos, shrimp gumbo and oysters) as well as affordable fish and chips in a rustic, unpretentious set up. Top tip: If you’re going for the fish & chips, opt for the cheaper house fillet – you won’t notice the difference once it’s been deep fried in batter. The newest addition to the Auckland bar scene is Beer Jerk Bunker, a cosy underground bar on Symonds Street owned by Luke White and Brent Grove, of beer subscription service Beer Jerk. The bar only seats around thirty people, but it’s beer list is seriously impressive, with over 100 to chose from, including cans from UK favourites Northern Monk and North Brew Co.
Top tip: Remember to eat dinner before visiting, or - you’ll walk out far later and feeling more drunk than you originally intended (I know I did). You’ll have to hop in a car and drive around twenty minutes east of the city centre to visit Hallertau Brewery’s taproom and German style biergarten, but with a delightful range of fresh beer to drink on site or takeway, and delicious wood-fired pizzas, you’ll be glad you made the trip. Tasting paddles cost between $12-16 for four small beers, which is probably all you’ll be able to drink and still drive home. Maybe get a taxi instead? Top tip: Hallertau are at their best when making true to style continental and world lagers. Try the supremely balanced Schwarzbier or the effortlessly light Japanese rice lager. The brewpub where Silverdale brewery Deep Creek originally started life is one of the hottest spots to drink in Browns Bay. As well as escaping the city, you’ll be able to enjoy fresh supplies of all of Deep Creek’s latest brews such as its deceptively sessionable Droptop Chardonnay Brut IPA. Hop on a bus from the city centre and make a day of it. Top tip: Be sure to visit on a Wednesday, when you can enjoy all you can eat ribs for $35. Book in advance to avoid disappointment - the venue sells 15 tonnes of these ribs a year! The short 45-minute ferry over to Waiheke Island ($40) is definitely something every visitor to Auckland ought to consider, even if just for the stunning views on the island alone. Throw 15 wineries into the mix, and it’s a must visit destination. Alibi Brewing Company operates out of the bottom floor of the highly renowned Tantalus Estate Vineyard, and its small-batch brews only very rarely make it to the mainland. Top tip: Grab yourself a pint of the brewery’s delicious New Zealand hopped pale and a crusty sourdough Reuben sandwich on. You won’t regret it. New Zealand Beer People: Søren Eriksen, 8 Wired Brewing Co.